More celebrity death news, Maila Nurmi, aka Vampira, has passed away of natural causes, according to Cinematical. 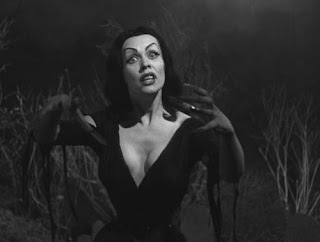 Made infamous by the films of Ed Wood like Plan 9 From Outer Space, she was already a semi-well known TV personality who was sort of a 1950s precursor to Elvira. She became immortalized by Tim Burton's Ed Wood (where she was played by Lisa Marie Presley), which chronicled the troubled production of Plan 9, widely regarded to be the worst film ever made.